Rest House Funatuya nestled in the lake side of Kawaguchiko provide group meal and souvenir stores. who visit the surrounding attractions. Please come to tour and visit us. 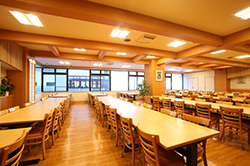 Dinning Facility Our facility is situated right next to Lake Kawaguchiko at the base of Mt. Fuji. The 2nd to the 4th floor of our south building is reserved for private dining and can accommodate up to 500 people. The space is adorned with tables and chairs and may be accessed by elevator. There is also a parking lot in front of the facility where tour buses may park free-of-charge. This is Funatsuya's recommended set meal. 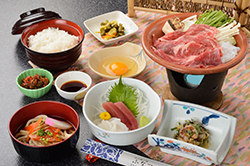 It includes pork and vegetables that are specially roasted on a ceramic plate for each guest to enjoy. Crispy, fried wakasagi fish accompany the set. Fried wakasagi fish can be changed to fried aji(horse mackerel). 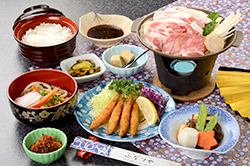 Nabe is a local cuisine of the Yamanashi prefecture. 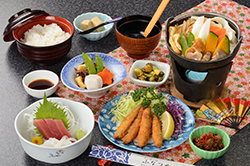 In the Sengoku period, nabe was enjoyed by the military of Yamanashi, thus making it a historic dish. This hot nabe includes flat noodles mixed with squash and a variety of other vegetables. The broth is rich with the flavors of miso, thus giving the dish a rustic, "countryside" appeal. Fried wakasagi fish can be changed to fried aji(horse mackerel). This set features beef and also available with a side of udon, therefore it is high in popularity. Guests may also request pork as an alternative. The meat is sweet in flavor and especially delicious when accompanied with beaten egg. Souvenir Shops Gifts and souvenirs are available for purchase at our tax-free store on the 1st floor. Confections include mochi rice cakes, manjuu steamed buns, sweet cakes, and a variety of other delicacies. Popular general goods include Mt. Fuji keychains and Japanese accessories. 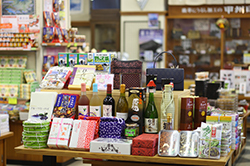 Guests may also find local Japanese sake, Koushuu wine, and imprinted leather goods. Please visit the souvenir shop after your meal for a taste of our highly popular soft serve ice cream. ※Click to enlarge the map. Copyright(C)2008 FUNATSUYA. All Rights Reserved.